Very small robots with an appetite for watch parts. In this excellent short story, Dan Burman is a famed inventor; however, he had actually invented only one machine - a psychophone that allows him to visit a kind of future. He brings back the blueprints for an unusual invention, one whose function is not immediately obvious. Once constructed, one of the machine's first actions is to use hidden mechanical arms to reach out and steal a fine clock and a pocket watch. Over time, the Robot Mother steals dozens of watches from local jewelry stores. The thefts are accomplished by tiny robots no larger than mice. 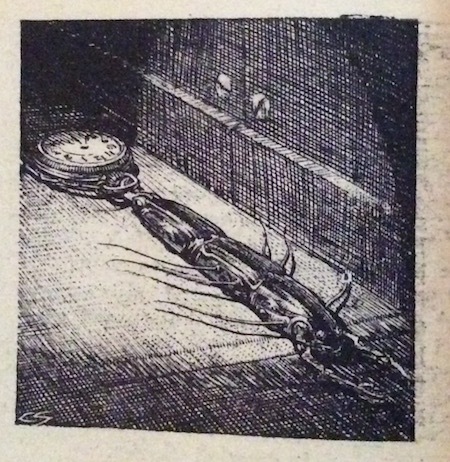 From The Mechanical Mice, by Maurice A. Hugi. The shuttle of a sewing machine is the special part that makes chain stitches possible; old-fashioned ones were roughly bullet-shaped, about one-half inch in diameter and an inch and a half long. The tiny robots stole watch parts for its controller, the Robot Mother. These tiny gears and screws provided the Robot Mother with the materials with which to create more golden shuttles, as well as other tiny bots. ... the nose cap of the [golden shuttle] had opened fanwise, like an iris diaphragm, and a pair of jointed metal arms were folded inside, hugging a medium-sized diamond. Be sure to take a look at the entry for Robot Mother, a very early reference to a self-reproducing robot that precedes scientific papers on the subject by at least seven years. You might also be interested in some of the children (and grandchildren) of this idea: Ray Bradbury's robot mice from The Martian Chronicles (1950) and dustmice, tiny robot detectives from Greg Bear's Queen of Angels (1990).